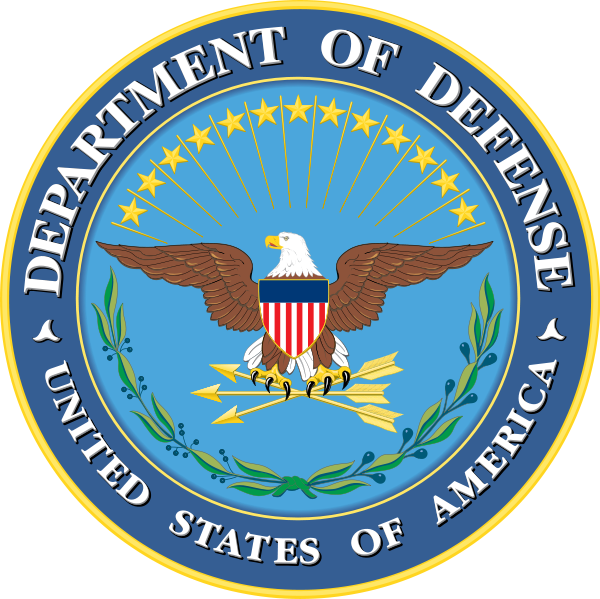 BACKGROUND: This report provides Department of Defense (DoD) contractor personnel numbers for 1 st quarter Fiscal Year 2019 (FY19) and current status of efforts underway to improve management of contractors accompanying United States (U.S.) Forces. It includes data on DoD contractor personnel deployed in Afghanistan, Operation Freedom’s Sentinel (OFS); Iraq and Syria, Operation Inherent Resolve (OIR); and the U.S. Central Command (USCENTCOM) area of responsibility (AOR). KEY POINTS: During 1 st quarter FY19, USCENTCOM reported approximately 53,062 contractor personnel supporting DoD in the USCENTCOM AOR, an increase of approximately 3,611 from the previous quarter. 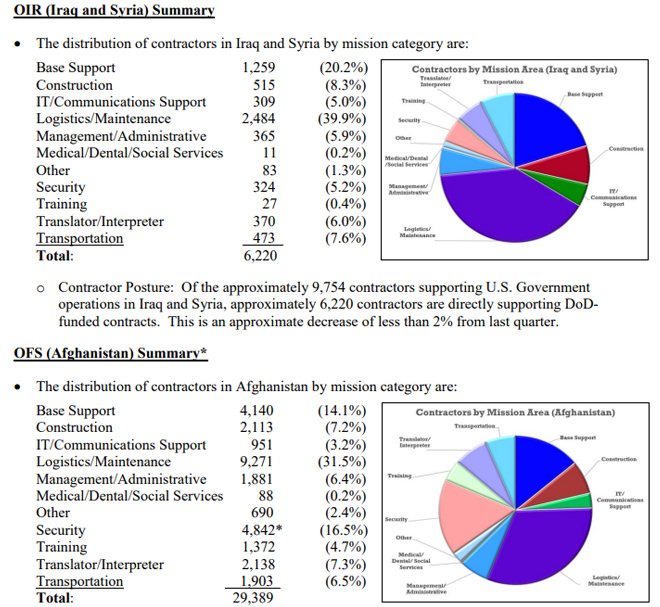 o Contractor Posture: Approximately 29,389 DoD contractors supported operations in Afghanistan during 1st quarter FY19, an increase of 16.4% from 4th quarter FY18. 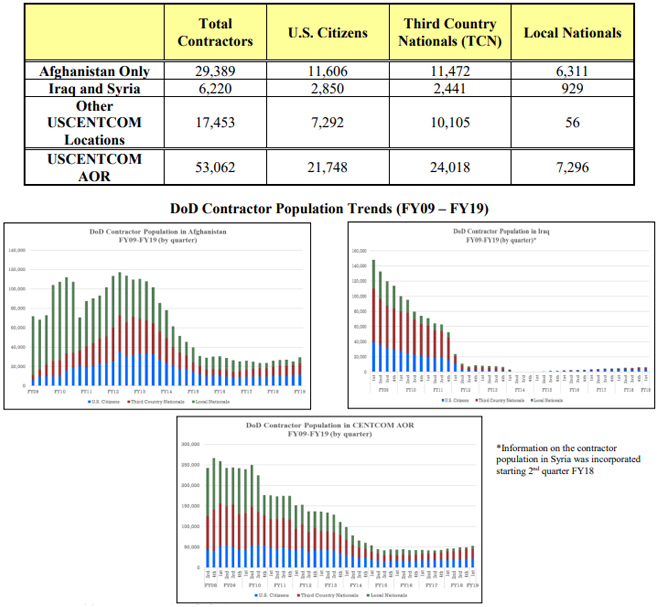 Local Nationals comprise 21.5% of total contractor force; 23,078 US/TCN remain to redeploy. 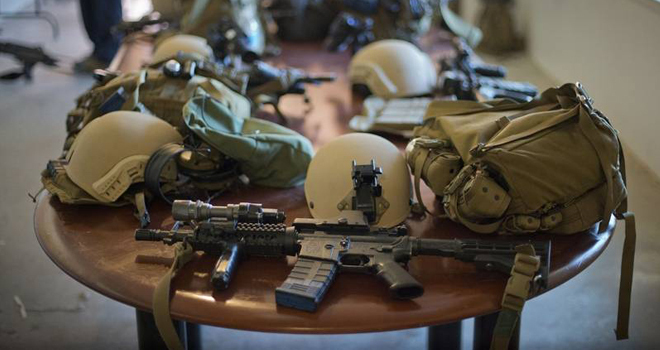 o A total of 2,847 Private Security Contractors (PSCs) were supporting USCENTCOM operations in Afghanistan as of 1st quarter FY19.  USCENTCOM Operational Contract Support Integration Cell (OCSIC). During this quarter, the USCENTCOM J4 (CCJ4) integrated OCS into the INTERNAL LOOK 19 exercise through the execution of the OCS working group. Additionally, USCENTCOM began transitioning OCS capabilities from Al Udeid Air Base, Qatar to Headquarters USCENTCOM, MacDill Air Force Base, Florida. The relocation will improve OCS integration and synchronization across the USCENTCOM staff. The relocation will be completed by May 2019.  Combined Joint Task Force-OIR (CJTF-OIR). 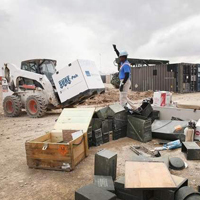 The 408th Contracting Support Brigade (CSB) continues to provide the contracting support for this Combined Joint Operations Area (CJOA) on behalf of US Army Central Command (USARCENT). During this quarter, the USARCENT Commanding General (CG) increased CJTF-OIR’s requirements validation approval threshold. The delegation of the CJTF-OIR CG reduces validation time for contracted requirements, accelerating support to the Warfighter. the execution of theater support contracts and Contingency Contracting Administration Services (CCAS). Close collaboration between ACC-A and the USFOR-A OCSIC continued and improved requirement preparation and validation, contract award timeliness, surveillance, and administration.  USCENTCOM Vendor Vetting. In accordance with the FY15 National Defense Authorization Act, Section 841, Never Contract with the Enemy, General Votel designated two companies, and associated entities, as supporting the insurgency. The designations ensure the companies will not be eligible for US Government contracts in the future. During the first quarter of FY19, the Vendor Vetting Decision Board considered 151 companies, resulting in 135 “Acceptable” rated companies (89.4%), and 16 companies rated as “Unacceptable without Mitigation” (10.5%).  Office of the Deputy Assistant Secretary of Defense (ODASD) Logistics. o 1st Quarter FY19 OCS Functional Capabilities Integration Board (FCIB). The OCS FCIB convened on December 4, 2018 to receive information on initiatives to support current and future contingency operations. The U.S. Africa Command Deputy J4 provided an information brief on current operations and challenges impacting operations in their AOR. The Board also endorsed a strategy to complete a new annual congressional report to congress in late January that measures the Armed Forces ability to provide OCS capability. 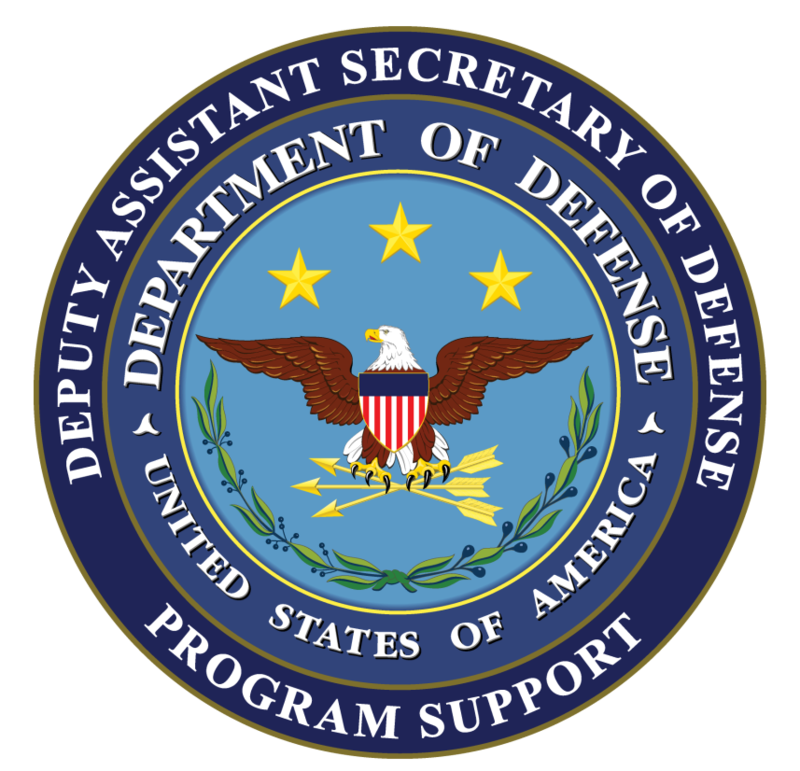 A Joint Staff J4 sponsored FY20 legislative proposal for Vendor Threat Mitigation (VTM) received DoD approval and is currently under review by the Office of Management and Budget, a significant milestone for the VTM program. The next quarterly FCIB meeting will be held on February 26, 2019.
o OCS Joint Doctrine, Organization, Training, materiel, Leadership and Education, Personnel, and Facilities-Policy (DOTmLPF-P) Change Recommendation (DCR) Implementation Underway. DoD-wide implementation of the Joint OCS DCR by 2022 is underway. Offices of Primary Responsibility in collaboration with Offices of Coordinating Responsibility are currently working to complete 54 comprehensive implementation plans to guide OCS capability integration efforts. The Joint OCS DCR Working Group will assess each plan prior to review and approval by the FCIB in February 2019. The first semi-annual implementation progress update to the Logistics Functional Capabilities Board is scheduled for January 24, 2019.
o Defense Standards for Security Services.  All DoD contracts for private security services require compliance with American National Standard Institute (ANSI) PSC.1-2012 (R2017), “Quality Management Standard for Private Security Company Operations” or ISO 18788-2015 “Management Systems for Private Security Operations.” All PSCs at any tier are certified to one or both of these standards.  A total of 72 PSCs from 16 different countries have achieved independent third party certification to one or both of these standards. Another 22 PSCs from 17 countries are known to have begun the certification process. This is an increase of 13% since the last report. o Global Support to Combatant Commanders: JCASO continues OCS planning efforts across the regions, domains, and functions to provide additional options for decision makers, including the most challenging scenarios identified in the current National Defense and Military Strategy. Simultaneously, during the reporting period JCASO responded to realworld global operations including support to: ATLANTIC RESOLVE in Poland, U.S. Army North for the mission in the southwest U.S., as well as support in the wake of Hurricanes Florence and Michael in the eastern U.S.
 USFOR-A OCSIC: JCASO has deployed a member to serve as Deputy Director of the USFOR-A OCSIC to support OCS efforts in the AOR.  OCS Planning: JCASO provides OCS planning support to CCJ4 including developing the final draft of the USCENTCOM Theater Distribution Plan Appendix 3 (OCS Appendix), a CCJ4-approved USCENTCOM Subordinate Command OCS Planning Template, and support to INTERNAL LOOK 19. In additional the JCASO Planners reviewed contract data to ensure contracts were not awarded to vendors identified as supporting the insurgency in accordance with FY15 National Defense Authorization Act.  OCS Tutor Pilot Program: OCS Tutors remained embedded with the Army, Air Force, Marine Corps and US Special Operations Command to assist in developing and implementing OCS programs, including training and product/tool development. At USARCENT, the tutor provided targeted, mission specific OCS tutoring/training to multiple echelon-above-brigade units scheduled to rotate into the AOR during the next cycle.  The Joint Staff (JS), J4, Operational Contract Support Division (OCSD). 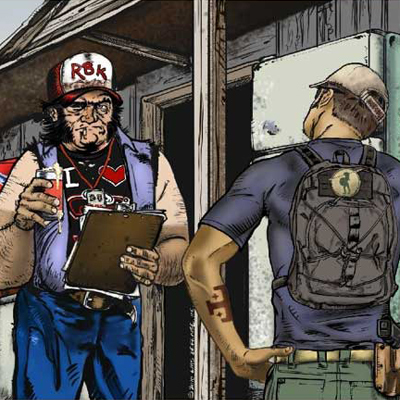 o OCS Reporting. The CJCS Risk Assessment on Contract Support was approved and incorporated in the Quarterly Readiness Report to Congress. Combatant commands, Services, and Agencies completed military OCS quarterly assessments and reporting to include identifying reliance by joint function. o OCS Education. OCSD, in cooperation with JS J7, completed the OCS portion of the Process for Accreditation of Joint Education assessment of the National Intelligence University (NIU) in Bethesda, Maryland. NIU met their OCS joint learning objective at the required level. o OCS Planning. OCSD continued to work closely with combatant commands to assess and develop approaches to planning for commercial support to operations. In concert with ongoing joint staff readiness reviews, OCSD focused on identifying and depicting commercial support interdependencies during contingencies and providing planning assessment and feedback on newly revised contingency plan noting significantly improved completeness and alignment with OCS policy and doctrine. This effort supports adaptation of plans to account for allied and partner contributions and reliance as well as a deeper understanding of the commercial space. OCSD comprehensively revised the OCS annex to the joint strategic campaign plan logistics supplement, setting guidance for planning OCS in globally integrated campaigning.  Joint OCS Planning and Execution Courses (JOPEC). OCSD delivered two (November and December) JOPECs to 49 students. Since the course’s founding in 2013, 1,374 students have been trained.  Joint Knowledge On-line (JKO). During the 1st quarter FY19, 782 personnel completed the Joint OCS Essentials for Commanders and Staff (JOECS) Phase 1 and 104 personnel completed the Phase 2 online course. As of December 21, 2018, 13,316 personnel have completed an OCS introductory online course.  Staff Joint Training. Finalized dates and set the tentative agenda for the U.S. European Command – NATO Support and Procurement Agency table top event on February 13, 2019 to be followed by a U.S.-only event on February 14, 2019 to examine processes and procedures during conflict.  The Office of the Chief of Naval Operations (OPNAV) published Instruction on OCS. On November 14, 2018, the Director of the Navy Staff signed and published OPNAV Instruction 3020.12, Planning for Operational Contract Support. This instruction prescribes policy, responsibilities, and requirements for supporting OCS for joint and naval operations, and implementing the DoD OCS policies.